That said, it’s important to be prepared before setting off on your winter camping adventure. From inclement weather to an impromptu dinner of rainbow trout, we’ve rounded up three of our favorite winter camping tips to help you prepare for your winter RV camping trip. While you likely won’t see temperatures dip below 40 during your stay in the Texas Hill Country, nights can be chilly. The best way to prepare for fluctuating winter temperatures and stay comfortable while watching the sunset from our rooftop deck is to dress in layers. Gloves may be appropriate as well, especially if you’re playing an evening game of bocce or horseshoes with fellow campground guests. Your RV’s kitchen should be stocked with the basics before you head out on the road. This gives you plenty of wiggle room to work with all types of fresh, local food. Where seasonings are concerned, start with the basics (salt and pepper) and go from there. If you’re hoping to catch fish, make sure to pack paprika, onion powder, and lemons. For more grocery needs, consider taking a scenic 30-minute drive to sunny San Marcos and its bi-weekly farmer’s market. Held every Tuesday and Saturday, the market hosts a variety of local vendors. Leafy greens and root vegetables are plentiful during the winter months at the San Marcos Farmers Market, and they’re easy to work into your winter camping menu. Don’t worry if you forget to pack a key ingredient or spice, however: the Mystic Quarry general store is stocked with the basics, and there are a variety of restaurants nearby. If fishing is on your winter camping trip agenda, you’ll appreciate that Mystic Quarry Resort and RV Campground is just a few minutes from the Guadalupe River where rainbow and brown trout have just recently been stocked into the river. Guadalupe River is the furthest south river to get stocked with trout. Keep in mind that trout like to use creek trails during the coldest months, and there are are a few harvest regulations to keep in mind. Depending on where you’re fishing, daily bag limit can be as few as 1 trout, and only one can be longer than 18 inches. This article goes into more detail on the area restrictions, or you can always give the front desk a call for fishing tips and information. One of the more popular fishing areas is called Devils Playground, which is one of the less residential areas of the river. For a daily fee of $10 you can enjoy this fishing spot which is conveniently located a quick drive from Mystic Quarry. 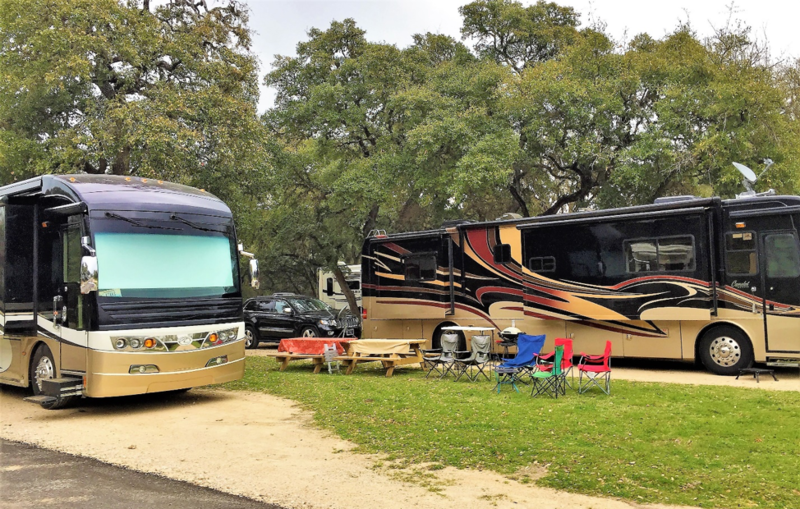 Here in the Texas Hill Country, winters are mild, making RV camping an enticing option. Our spacious RV campground offers a dynamic hodgepodge of variety, where you can hike a scenic nature trail and then relax in your RV or catch your favorite TV show in the rec hall. Get the most out of your stay at Mystic Quarry, and enjoy our great amenities, friendly staff, and beautiful RV campgrounds.